Also serving communities of Paradise Valley. There are 157 Assisted Living Facilities in the Scottsdale area, with 59 in Scottsdale and 98 nearby. The average cost of assisted living in Scottsdale is $3,393 per month. This is higher than the national median of $3,346. Cheaper nearby regions include Tempe with an average starting cost of $2,963. To help you with your search, browse the 653 reviews below for assisted living facilities in Scottsdale. On average, consumers rate assisted living in Scottsdale 4.2 out of 5 stars. Better rated regions include Gilbert with an average rating of 4.3 out of 5 stars. Caring.com has helped 19 families in Scottsdale find high-quality senior care. To speak with one of our Family Advisors about assisted living options and costs in Scottsdale, call (855) 863-8283. Scottsdale, Arizona, located in the Sonoran Desert, boasts many fun things to do from arts and cultural activities to outdoor adventures. Seniors make up 22 percent of the population, estimated close to 250,000. Those in need of help with daily tasks will find a wide selection of options, as the city is home to 58 facilities. 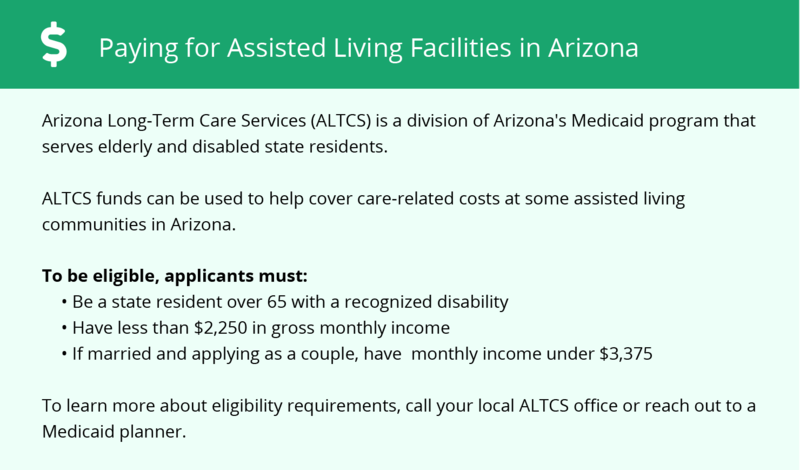 Assisted living facilities (ALFs) in Arizona provide three levels of care: general supervision, personal care and assistance with activities of daily living. The assisted living homes serve up to 10 residents, while assisted living centers serve 11 or more. Scottsdale offers a warm climate during the winter, with daytime averages in the 60s, but the summer heat can be stifling. The daytime average high in July is 104 degrees Fahrenheit. The air quality in Scottsdale is slightly better than the national average. However, the American Lung Association ranks Scottsdale as the 8th city most polluted by ozone in the U.S. The risk of developing a respiratory disease is higher in Scottsdale than the state and national averages. Paired with the heat, the air quality may not be suitable for seniors with certain health conditions. The overall cost of living in Scottsdale is higher than the state and national averages, but groceries and health care costs are slightly lower than average. The biggest cost difference is housing, which is more than double the typical cost of housing in Arizona. Residents of Scottsdale pay lower income taxes than the average U.S. citizen, with rates at 3.4 percent and 4.6 percent respectively. Sales tax is 8 percent in Scottsdale, versus the U.S. average of 6 percent. Scottsdale offers an extensive public transit system, which includes a regional bus system, a paratransit service and free trolley routes. Seniors pay reduced fares. Scottsdale has an array of community resources for seniors, including the "All Things Senior" Expo, an annual event offering entertainment and resources designed for people 50 and older, as well as the Granite Reef and Via Linda senior centers, where seniors enjoy fitness facilities, art programs, recreation classes and a softball league with weekly practice and games. Assisted Living costs in Scottsdale start around $3,393 per month on average, while the nationwide average cost of assisted living is $4,000 per month, according to the latest figures from Genworth’s Cost of Care Survey. It’s important to note that assisted living rates in Scottsdale and the surrounding suburbs can vary widely based on factors such as location, the level of care needed, apartment size and the types of amenities offered at each community. 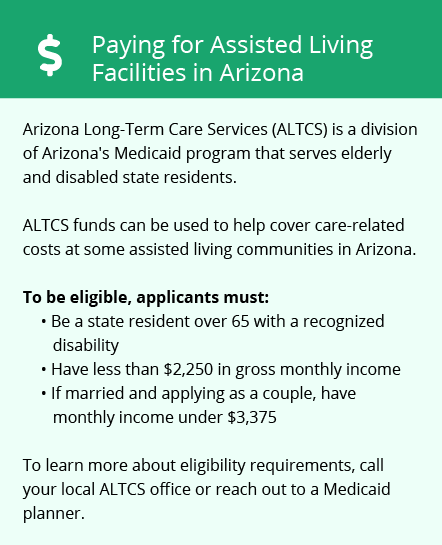 Seniors who qualify for long-term care can receive financial help for assisted living through the Arizona Health Care Cost Containment System (AHCCCS). The Arizona Long-Term Care System (ALTCS) assigns a case manager to help coordinate plans. Financial assistance may be offered through a health plan similar to an HMO or through a Medicaid demonstration waiver. Residents may be required to pay the room and board expenses out of pocket. Scottsdale and the surrounding area are home to numerous government agencies and non-profit organizations offering help for seniors searching for or currently residing in an assisted living community. These organizations can also provide assistance in a number of other eldercare services such as geriatric care management, elder law advice, estate planning, finding home care and health and wellness programs. To see a list of free assisted living resources in Scottsdale, please visit our Assisted Living in Arizona page. Scottsdale-area assisted living communities must adhere to the comprehensive set of state laws and regulations that all assisted living communities in Arizona are required to follow. Visit our Assisted Living in Arizona page for more information about these laws.